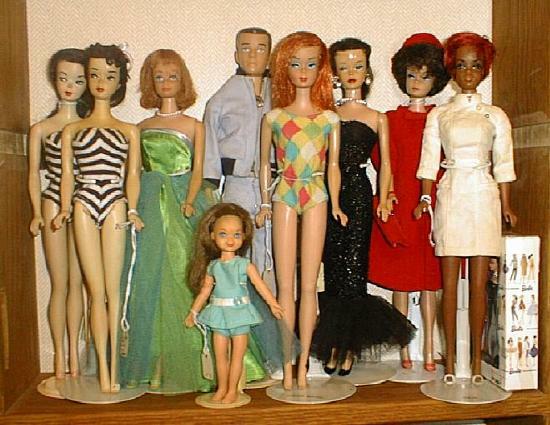 Mattel's Barbie has been around since 1959. She's certainly changed over the years. But, she's always been at the forefront of what's happening with most of the youth culture. 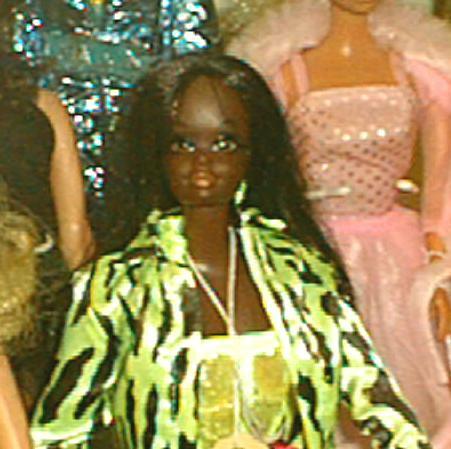 In the first picture, the 1967 Black Francie doll in the pink dress, was the first African-American doll Mattel put out in the Barbie line. She didn't sell well - America wasn't ready for her - and she is now one of the rarest dolls in the collectible Barbie family. In the third picture, the doll in the back in the far left corner, is, in fact, a rare No. 1 Barbie doll - purchased many years a go with a lot of dolls for $8.00. Unfortunately, she's kinda shy for this picture because some overly happy little girl from her past decided to give her a shorter hairstyle. She knows she's still valuable - but she's very camera shy in that black wig. Someday I will have her crowning glory redone properly. The similar doll in front her her in the swimsuit is a No. 3 Barbie. She was the only Barbie from that era with brown eye shadow and is in excellent condition. 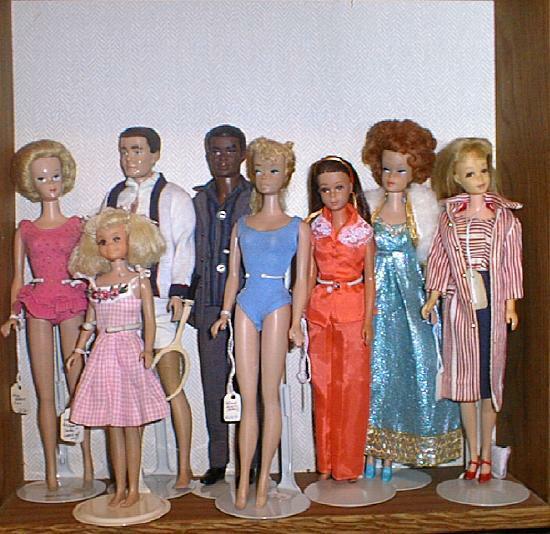 Designer Barbie dolls became popular starting with the 1988 Happy Holiday Barbie dolls. 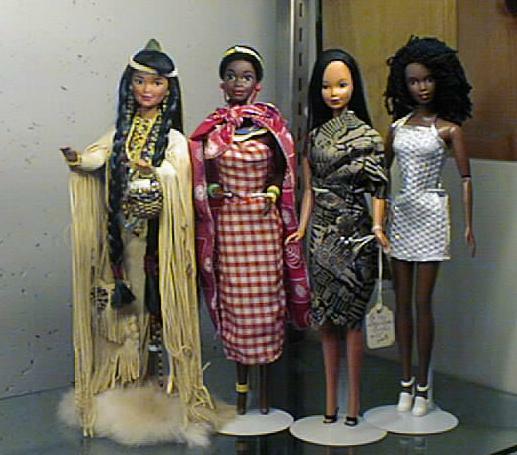 Now there are many different fashion dolls on the market by different manufacturers and artists. 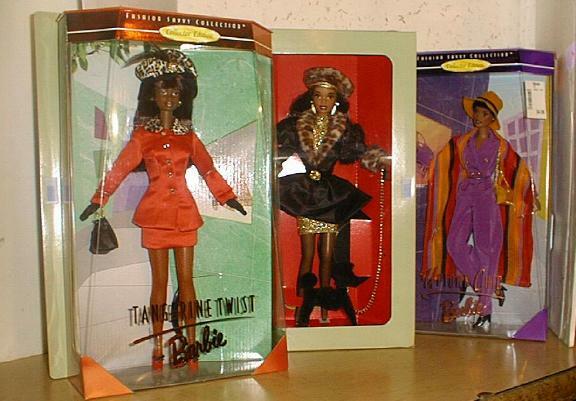 There is even a magazine - Haute Doll - devoted entirely to many different high fashion dolls.